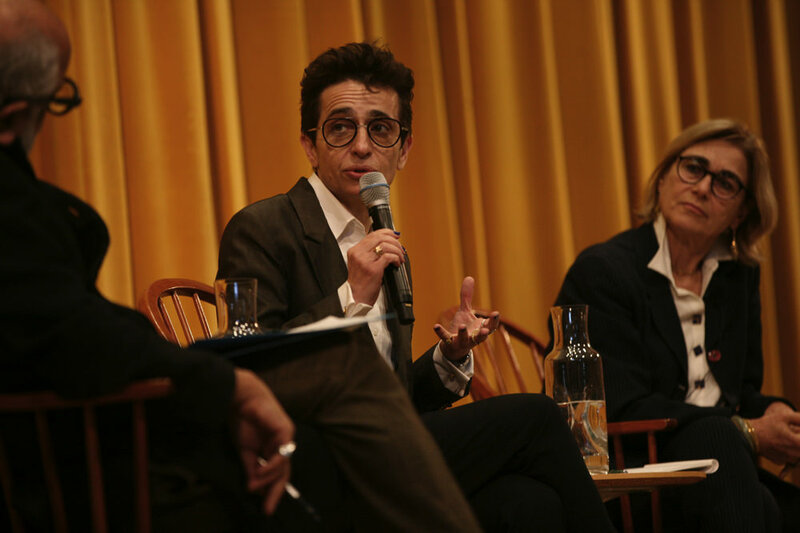 Masha Gessen seemed to become famous in the United States for the essay “Autocracy: Rules for Survival,” published two days after the 2016 presidential election in The New York Review of Books. The Russian-American journalist and author is best known for writing on LGBT rights in Russia, Russian president Vladimir Putin, and totalitarianism. And in the last few years, as global migration flows have grown in importance, Gessen has also become recognized as a thinker on immigration in the modern world. The writer’s texts combine decades of reporting on immigration with a clear-eyed, unreserved point of view on human freedom of movement. Last Wednesday, during the first installment of this year’s Tanner Lectures on Human Values, Gessen said: “I don’t think there’s anything morally justifiable about the existence of borders.” The writer’s topic for both lectures was migration—how to think, talk, and argue about it in a world that takes national borders for granted, as a legitimate way of deciding where people get to live, and what sort of life they are entitled to live. For Gessen—whose recent writing has covered totalitarians’ use of language—language is at the center of how immigration is understood, and how immigrants explain themselves to a society that doesn’t understand them. Choices about what descriptions are used—“illegals,” “undocumented,” “hordes,” “caravans,” even the word “migrant” itself—are not second-order concerns; they order our reality. “Journalists casually use terms like crossing the border illegally when referring to asylum seekers—when in fact there is no law that says they must use the ports of entry,” Gessen said in a 2018 talk quoted by Rothenberg professor of the humanities Homi Bhabha, who introduced the lecturer last week. Gessen’s first lecture, “How We Think About Migration,” was what the writer described as an “experiment” in talking about migration: “what a concentrated effort to tell stories about migration would look like.” What followed were 57 stories, narrated in just under an hour, of immigration and displacement around the world. Gathered from Gessen’s reporting, they reached back to the Kosovo War in the 1990s, and covered people displaced because of their ethnicity, their sexuality, or their politics. One woman in a refugee camp in Montenegro told Gessen her family was rich in Kosovo. “I knew she was lying,” Gessen said, “because in these places where there are refugee camps and a lot of refugees congregating, the class structure wherever they come from actually becomes much more stark.” The refugees who could afford it were staying in private accommodations; those who couldn’t were in camps and tents and trailers. Gessen told that story not to catch the woman in a lie, but to begin to develop an argument about migration: immigrants lie just as everyone else lies, and are perhaps even more likely to lie, to prove that they are worthy of belonging somewhere. Gessen has long condemned the narrative of the “good immigrant”—asserting that in reality, there is no such thing. Anastasia Schimanski, a Russian immigrant whom Gessen wrote about for The New Yorker last year, first came to the United States with her mother on vacation when she was 11. The Soviet Union began to collapse while they were gone, so they stayed and eventually acquired green cards. At 18, Schimanski joined the navy, but soon thereafter began experiencing symptoms of Charcot-Marie-Tooth disease, Gessen said, “a degenerating disease that causes deformities of the extremities and chronic pain. She never made it through basic training. She’s had 18 operations, and she got addicted to opioids. It’s a typical American story of addiction…And while she was addicted, she racked up 23 arrests.” The worst of them, for a forged $40 check, became an aggravated felony for which she could be deported. “She served 19 days for it in 2004. Eight years later, she was detained by ICE.” Her lawyer argued, correctly, that Schimanski barely spoke Russian because she had immigrated as a child, and that as a lesbian she would be in mortal danger in Russia. We tell stories when we apply for asylum, we tell stories when we introduce ourselves to other people. We try to explain who we were in an entirely different context, in an entirely different place, an entirely different time. One might say that we lie. Because that story is not translatable into this story. It is always a fiction. It is always a process of readjusting and reinterpreting to make yourself understood, to make yourself acceptable, to make yourself deserving of the status you’re going to be given. And, in fact, what you do is you try to place yourself in a category. Are you a refugee or a migrant? Are you a political migrant or an economic one? Are you a poor person or rich person? Are you a suffering person or a privileged person? Did you come far? Have you been on the move long? What, in the end, do you deserve? The story that you tell gives you the rights. At the very end of Gessen’s second talk, which was followed by a long, searching discussion with Moyn and Homi Bhabha, one audience member asked how a reporter can come to grips with the power that position gives over people’s lives. The answer was stirring: increasingly, Gessen finds it unbearable to tell the stories of immigrants. As that writing has grown in influence, it has gained the ability not just to shape discussion of immigration, but also to directly affect the fates of the lives reported on. One story in The New Yorker can decide whether or not an immigrant is deported. And as that happens, Gessen said, “it gets harder and harder. I find that kind of proof of the power of a journalist to be unbearable. Because if I can exercise that power, then what am I doing the rest of the time? What about the other people? What about the hours I spend doing something else?” And what about the fact that the details Gessen chooses to tell about each life are different from what they would tell about their own lives—that stories are all that people have to understand themselves, and Gessen has taken on the power of the storyteller?